The year 1811 started off with an amazing sight, one not many humans are “lucky” enough to see in their lifetimes. The great comet of 1811 was first spotted in March of 1811 and its intensity increased through December 1811. Some recordings show it had a tail 25 Degrees Long and a head 50% larger than the sun. The appearance of a great comet, which was visible around the globe for seventeen months, and was at its brightest during the earthquakes. The comet, with an orbit of 3,065 years, was last seen during the time of Ramses II in Egypt. In December of 1811 the comet appeared to some observers to “fade” and to others it appeared to “perform frightening acrobatics and split in two”. Curiously, it also had a circumpolar orbit as viewed by many, staying within view for 24 hours a day at certain latitudes, appearing to be “homing in” on the earth. The Great Comet of 1811, with a coma over a million miles across, was visible in the sky for almost a year. The Comet of 1811 was the brightest comet with the longest duration of brightness on record (260 days) until Comet Hale-Bopp in 1997. To many people, the appearance of this unusual celestial visitor in the night sky portended doom. The comet passed closest to Earth on October 20th. The head and coma of the comet was reported to be wider than the diameter of the Sun and it had a very long, bright tail despite not coming very close to the Earth. Two months later, on December 16th, the first of three extraordinary earthquakes struck the midwestern and southern United States. These quakes were so intense they shook even New England, and for a time parts of the Mississippi River flowed backward. The temblors may have been magnitude 7 or 8 — strong enough to cause significant damage. And some people blamed them on the comet. Unfortunately for those in living near New Madrid, Arkansas in December 1811, this comet made life anything but ordinary. The massive New Madrid earthquakes began in December 1811 and continued through the Spring of 1812. The “comet” appeared to leave in 1812, although there is some uncertainty as to whether it really left entirely. During the winter of 1811-12, a series of some 1,874 recorded tremors within the New Madrid fault dramatically altered the landscape on some 30-50,000 square miles of land creating Reelfoot Lake in extreme northwest Tennessee. 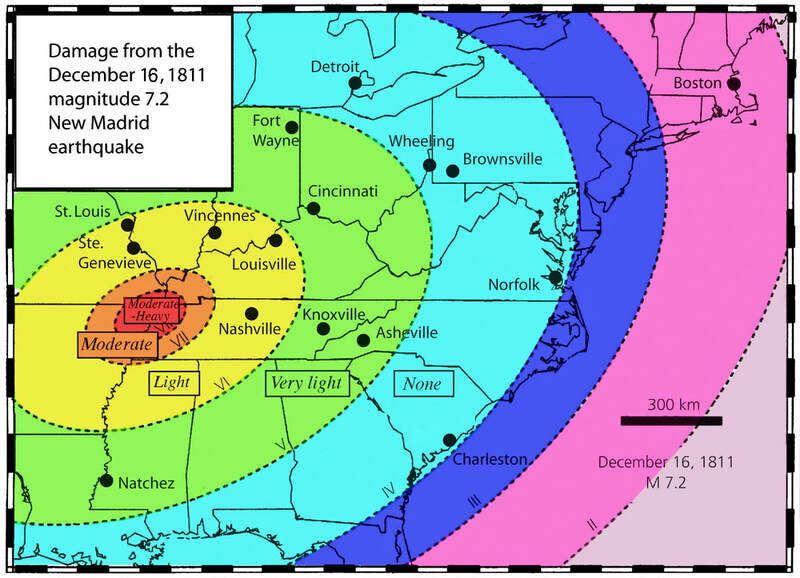 The New Madrid Earthquake, the largest earthquake ever recorded in the contiguous United States, occurred on February 7, 1812, with magnitude estimates greater than 8.0 on the Richter scale. It got its name from its primary location in the New Madrid Seismic Zone, near New Madrid, Louisiana Territory (now Missouri). The first earthquake preceded three other major quakes: two on December 16, 1811, and one on January 23, 1812. There were also numerous aftershocks in the area for the rest of that winter. There are estimates that the earthquakes were felt strongly over 50,000 square miles and moderately across nearly one million square miles. The New Madrid earthquakes were the biggest earthquakes in American history. They occurred in the central Mississippi Valley, but were felt as far away as New York City, Boston, Montreal, and Washington D.C. President James Madison and his wife Dolly felt them in the White House. Church bells rang in Boston. From December 16, 1811 through March of 1812 there were over 2,000 earthquake aftershocks in the central Midwest, and between 6,000-10,000 earthquakes in the Bootheel of Missouri where New Madrid is located near the junction of the Ohio and Mississippi Rivers. In the known history of the world, no other earthquakes have lasted so long or produced so much evidence of damage as the New Madrid earthquakes. Three of the earthquakes are on the list of America's top earthquakes: the first one on December 16, 1811, a magnitude of 8.1 on the Richter scale; the second on January 23, 1812, at 7.8; and the third on February 7, 1812, at as much as 8.8 magnitude. After the February 7th earthquake, the Mississippi River actually ran backwards for several hours. The force of the land upheaval 15 miles south of New Madrid created Reelfoot Lake, drowned the inhabitants of an Indian village; turned the river against itself to flow backwards, it devastated thousands of acres of virgin forest and created two temporary waterfalls on the Mississippi. Boats floating in the middle of the Ohio River they were protected from the earthquake tremors shaking the land, but not from the hazards of falling trees, disappearing islands, and collapsing river banks. The area of strong shaking associated with these shocks was two to three times larger than that of the 1964 Alaska earthquake and 10 times larger than that of the 1906 San Francisco earthquake. The midwest experienced more than 2,000 earthquakes in five months, people discovered that most of crevices opening up during an earthquake ran from north to south and they would chop down trees in an east- west direction using the trees as a bridge. There were "missing people" who were most likely swallowed up by the earth. Some earthquake fissures were as long as five miles. Sand Boils The world's largest sand boil was created by the New Madrid earthquake. It is 1.4 miles long and 136 acres in extent, located in the Bootheel of Missouri, about eight miles west of Hayti, Missouri. Locals call it "The Beach." Other, much smaller, sand boils are found throughout the area. Earthquake Lights Lights flashed up from the ground, caused by quartz crystals being squeezed. The phenomena is called “seismoluminescence." The 1811-1812 earthquakes caused at least 221 landslides along the bluffs that define the eastern boundary of the Mississippi River. This implies that most of the landslides were triggered by a series of event, which is likely to have been the 1811-1812 earthquakes. Sounds of distant and loud prolonged peals of thunder and loud explosions accompanied the earthquakes. People reported strange behavior by animals before the earthquakes. They were nervous and excited. Domestic animals became wild, and wild animals became tame. Snakes came out of the ground from hibernation. Flocks of ducks and geese landed near people. There were temporary river waterfalls where the Mississippi ran backwards during 1811-12 earthquakes. It happened when a thrust fault created a sudden dam several feet high near the bottom of the river loop near New Madrid. It lasted for a few hours, though the new dams/waterfalls lasted for a few DAYS, and ruined several flatboats. The uplift caused both a dam and waterfalls at different locations and raised eight to ten meters (26 to 33 feet). This is the event that created the so-called "Kentucky Bend", a small peninsula was created; it covers a land area of 17.5 sq miles, and is bordered on three sides by the Mississippi River. Alexander Davidson decides its a good time to write his will. I give and bequeath to my beloved wife Mary my real and persona] Estate during her natural life under the following restrictions towit That as the several Legatee share under named shall come of age she the said Mary shall give them as followeth: To my Sons: Jesse Davidson Thirty pounds in Stock and household furniture; The said Mary shall give in like Stock and furniture as above mentioned to Abram Jacob Ellice Asa and Alan Albert Davidson and my Daughters: Elizabeth and Sarah Davidson the sum of fifty Pounds to each of them should my 26 wife Mary decease before the above Legatees or any of them be entitled to and receive the above sums they shall never the less receive their respective shares of Fifty pounds befor an equal division shall take place. But at my said Wifes' death and after the said Legatees whether of age or non age have received their portions heretofore assigned them Then the remainder of my real and personal Estate shall be divided as folows towit: Equally betwen all my sons and Daughters and Step Daughters name1y: James, John, Alexander, Ann, Hezek1ah, William Margaret. Elizah, Benjamin, Isaac, Elizabeth, Jesse, Sarah, Rachel Abram, Jacob, Ellis, Asa, Alan and Albert Davidson. (This Instrument of writing purporting to be the last Will & Testament of Alexr. Davidson Senr. dec'd was produced in Court & William Trigg & George Murrel two of the subscribing Witnesses being sworn deposeth that the said Alexr. Davidson delivered the said writing as his Last Will and the believe he was of a proper deposing mind and memory and thereupon the said writing was ordered to be recorded as the true last Will & Testament of the said Alexander Davidson.